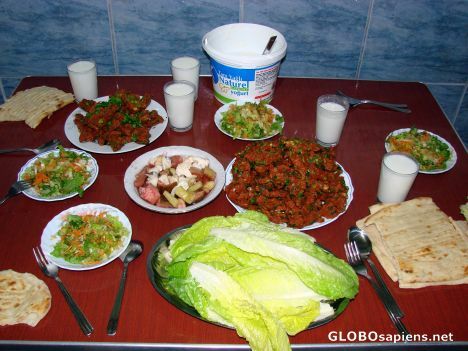 raw mince meat is kneaded with wheat, spices, tomato and pepper sauce, onion etc for more than one hour, delicious and spicy taste..
Tasty indeed and ayran is a good drink to go with it. What is the green stuff in front? Burak - lucky I've eaten recently. I guess this wouldn't taste so good if I had to get it off the computer! Now I see. It is the same kind of lettuce we had in Greece. I think it is Kos lettuce, and only eaten in winter. The same in Turkey?